REI has extensive experience with combustion in utility boilers. REI has modeled over 200 different utility boilers firing a range of fuels including coal, oil, gas, biomass, syngas, TDF and blends of these fuels. Types of systems modeled include arch-fired, cyclone-fired, roof-fired, tangential-fired, turbo-fired and wall-fired units. REI’s primary expertise is in pollutant formation (e.g., NOx control), but we also have experience with furnace performance and operational impacts. REI is also involved with developing next-generation models to evaluate the performance of Air Pollution Control Devices (APCD) downstream of boilers. A major focus here is the behavior of mercury, sulfur oxides and particulates as combustion products move from the boiler to the stack. Components studied include SCR, ESP, scrubbers and baghouses. REI was hired by the EPRI sponsored Cyclone NOx Control Interest Group (CNCIG), a consortium of electric utilities with cyclone-fired boilers, to evaluate the NOx reduction potential in coal-fired cyclone barrels. Consideration was given to potential design and operational modifications to the cyclone barrel including coal chute design, fuel changes, fuel blending, coal fineness, air staging, air biasing, air preheating, water injection, flue gas recirculation and combinations of these modifications. Results focused on predicted NOx reduction as well as other aspects of barrel operation such as slag freezing and corrosion potential. Computations were performed using REI’s proprietary coal combustion simulation code GLACIER. Barrel O2, CO, temperature and NOx predictions were validated with field measurements and were used in conjuction with cyclone-fired boiler models to predict NOx formation in utility boilers. Predicted results led to design and operational changes in several boilers. REI was hired by the EPRI sponsored Cyclone NOx Control Interest Group (CNCIG), a consortium of electric utilities with cyclone-fired boilers, to evaluate the NOx reduction potential of coal-fired cyclone boilers. This work was a follow-on to coal-fired cyclone barrel studies performed previously for CNCIG. Results showed that NOx formed in the furnace section of opposed wall cyclone-fired boilers can be significant and was dependent on the thermal environment in the lower furnace. This lower furnace environment was also found to provide significant opportunities for NOx destruction. NOx reduction from baseline conditions was evaluated under modified cyclone operating states including water injection, FGR, staging and biased firing conditions. Computations were performed using REI’s proprietary combustion simulation code BANFF. Results were validated based on boiler tests conducted by CNCIG members. Predicted results led to design and operational changes in several utility boilers. The REI two-phase combustion code GLACIER was used to simulate combustion in a 880MW tangenially-fired coal furnace with a low NOx firing system. The problem being addressed was increased water wall corrosion that occurred after the low NOx retrofit. Predictions of combustion gas properties and wall temperature and deposit composition were examined in regions where high rates of water wall corrosion occured in the furnace. The simulation results were used to recommend changes in operating conditions and simple retrofits that would reduce the corrosion. The REI coal combustion code GLACIER was used to simulate the combustion in a 160 MW wall-fired coal furnace with low NOx burners. The objective was to examine the causes of poor coal burnout in the furnace that occurred after the low NOx retrofit. This application highlighted the benefit of the detailed coal combustion and particle tracking models within GLACIER. The simulations indicated that regions of low oxygen along the rear wall of the furnace were responsible for the poor burnout. This information was used to recommend changes in the overfire air design that would significantly reduce the amount of unburned carbon in the fly ash. REI’s one and two phase turbulent reacting flow codes BANFF and GLACIER were used to model the performance of Selective NonCatalytic Reduction (SNCR) in large scale coal-fired boilers. The purpose of the evaluation was to assess the capabilities of SNCR technology to reduce NOx emissions on large boilers. The two pulverized coal-fired units evaluated were: a 500 MW wall-fired boiler equipped with low-NOx burners and overfire air and an 880 MW tangentially fired boiler equipped with a low NOx concentric firing system which includes separated overfire air. The project involved three phases. First, full-scale measurements were made to map the temperature and emissions characteristics of the upper furnace. Then physical models were utilized to screen various reagent injection scenarios. Finally, computational fluid dynamics models were used to assess the NOx reduction performance of the most promising reagent injection scenarios for each of the two boilers. Both low and high-energy injection scenarios were simulated utilizing both anhydrous ammonia and aqueous urea reagents. REI’s two-phase combustion simulation code GLACIER was used to predict flow patterns, spray distribution, droplet evaporation and gas temperatures in the inlet duct of an incinerator ESP. Results were used to evaluate injector designs in terms of spray coverage, mixing with flue gas and droplet surface deposition. Results showed that perforation plates should be used to improve the flue gas flow distribution before injection and that the best mixing and coverage were achieved by using a large number of injector nozzles distributed evenly across the duct. REI provided computational support to the DoE Combustion 2000 Low Emission Boiler System (LEBS) project for a new low NOx coal-fired boiler design developed by DB-Riley. The overall objective was to develop relatively near-term technologies to produce coal-fired Low-Emission Boiler Systems (LEBS) ready for full scale commercial generating plants by the end of the decade. The DB Riley Team consisted of Reaction Engineering International, Sargent & Lundy, LLC, ThermoPower Corporation, and the University of Utah. The LEBS concept developed by the DB Riley team included a supercritical boiler fired with a low-NOx, slag-tap firing system, a regenerable desulfurization system with de-NOx capability, advanced low-temperature heat recovery, and particulate removal. 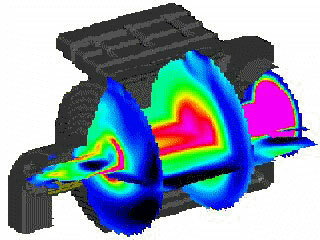 The computations were performed with GLACIER, the REI coal combustion simulation tool. Key elements of the design were the use of multiple low NOx burners in a down-fired configuration, a novel slag screen design and the use of staged air injection in the vertical stack. The use of the computational model allowed predicting the impact on NOx reduction for a wide range of operating conditions including the use of coal reburning and burner staging. REI also worked with the University of Utah to provide experimental support by operating the DB Riley Low NOx coal burner at 5 MM Btu/hr in the L1500 test facility located at the University of Utah. The experimental side of the LEBS program demonstrated the low NOx firing concepts at 5 MM Btu/hr (UofU/REI), at 100 MM Btu/hr (at the DB Riley Test facility in Worcester, MA), and at the multi-burner Proof-of-Concept (POC) scale (located at the Turris Mine site in Illinois). Computational modeling of the experiments at the 5 MM and 100 MM Btu/hr scales provided validation of the scaling capabilities of GLACIER, which was used to assist in the design of the new POC facility. REI’s GLACIER combustion modeling software provides the capability to track unburned carbon in fly ash or LOI from different burners or groups of burners in a coal-fired boiler. This powerful capability allows operators to understand potential impacts of installing low-NOx burners or implementing overfire air designs. It also provides operators with insight in how to adjust the operation of a few specific “bad actor” burners to significantly reduce LOI. REI commonly uses this type of analysis in conjunction with evaluation of NOx reduction technologies to determine the operational impacts of the reduction technologies.